2016–What a year! Since learning Rio de Janeiro would host the 2016 Olympic Games, back in 2009, we at Catalytic Communities realized we’d need to focus our attention on supporting favelas through the often difficult changes they would experience during those subsequent years. Documentation, visibility, analysis and media exposure would be the most important resources CatComm could provide to Rio’s favelas during this period and we set out building a set of resources and tools that would thoroughly and conscientiously do just this. Starting with our award-winning bilingual watchdog favela news site RioOnWatch, which focused on documenting community perspectives on the transformations taking place in Rio starting in 2010, we witnessed the demand for favela news from communities and the world at large, and the opportunity to use the Olympic spotlight to change the damaging, inaccurate narrative that has kept favela communities marginalized for a century. CatComm thus noted the opportunity presented by Rio’s mega-event years to improve the narrative surrounding favelas, given the greater quality and quantity of coverage Rio would experience during these years. We set out to provide a number of tools to hasten improvements in coverage, beyond RioOnWatch, including our RioONWire favela news wire, World Cup press resources, press materials and Olympics Resources for Journalists, analyzing the Best and Worst reporting on favelas regularly, alternative press conferences, community contact lists and maps, reality tours, and one-on-one support for journalists covering Rio, which over time resulted in hundreds of reports supported or facilitated by the CatComm team. CatComm also kept track of all international coverage through monthly digests sent to researchers’ and journalists’ inboxes. 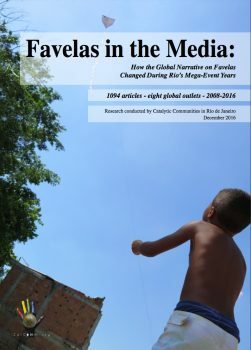 And, as 2016 came to a close and closing out the cycle, we finalized, published and launched our 8-year longitudinal analysis of how media coverage did and didn’t in fact change during those critical years, our “Favelas in the Media: How the Global Narrative on Favelas Changed in Rio’s Mega-Event Years.” This report has now been cited by Vice and the Knight Center for Journalism in the Americas. Below is a description of all we accomplished with your help specifically in 2016, and, at the very bottom, how we intend to build on this work in 2017: taking our conclusions from “Favelas in the Media” and working to increase the influence of favela community journalists and their outlets, while transitioning RioOnWatch into a proactive, action-inspiring news source rooted in Rio’s favelas. This will include a comprehensive mapping of sustainable practices and initiatives in favelas, and a week-long exchange among sustainable favela programs in 2017. RioOnWatch reached new heights, won Webby Award–This year RioOnWatch reached new heights in terms of productivity, readership, influence and recognition. Since its launch in 2010 as an experimental crowdsourced news blog for community leaders from Rio’s favelas, RioOnWatch has documented the rapid change taking place in Rio’s favelas in 1958 inter-linked articles by 460 writers, in English and Portuguese (thanks to 143 volunteer translators), that paint a broad yet characteristically hyperlocal picture of the changes underway in the city from favela perspectives, interweaving topics and styles in a way that has uniquely built knowledge and understanding, and informed debates, across Rio’s favelas, the public sphere in Brazil, and around the world. Our hyperlocal-to-global media approach has yielded a model which was increasingly recognized during the year, including in May when the site won a Webby Award, August when we were part of NPR’s On the Media and when the site and CatComm’s broader media work were recognized in The Development Set’s “The Tiny NGO That Changed Reporting on Rio’s Favelas During the Olympics,” and December, when this same article was published in The Guardian Global Development under the title “No more ‘rat kids’: Fighting the way we think about the residents of Rio’s favelas.” The site was also recognized in The Huffington Post in November, and is the subject of a forthcoming chapter, “Transforming Policy Through Discourse Intervention: RioOnWatch, favelas, and the 2016 Olympic Games,” in a book on the Rio Games from authors at the University of Brighton. This year we saw growth in both reach and quality of output, publishing 626 articles between English and Portuguese, including 71 by favela-based journalists and activists and the bulk of the remainder by international observers and research-collaborators from a wide variety of fields. We also encouraged and witnessed a greater repurposing of content among media partners, like ArchDaily Brasil and Shareable. Due to demand from a broad contingent of readers, we have now decided to maintain and evolve RioOnWatch beyond the Olympic Games, when we had originally planned to archive the site. Read more about these plans when we announce our work in 2017 below. RioOnWatch During the Olympics–Specifically during the August Games, we saw the culmination of our six-year work building RioOnWatch, with a team of 33 incredibly talented volunteer interns from five continents who successfully doubled our coverage of favela events, initiatives and developments that month. We also had a network of 99 volunteer translators assuring every article was quickly translated during this critical time. As a result of their amazing work, our social media reach grew to an all-time high of 393,000 in August, up from 236,000 during the World Cup in 2014 and 2-3 times our normal monthly average. Specifically, RioOnWatch doubled its readership during the Games, and published a record-breaking 80 articles (English and Portuguese) in August. 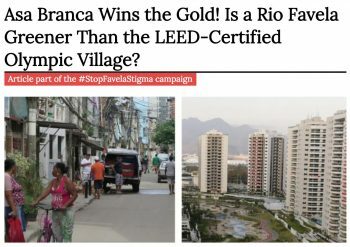 Special Content and Research Series–In 2016, we published a number of strategic opinion-forming series, including our: Best/Worst reporting analysis of the international media covering favelas, a community opinion series on the impeachment of Brazilian President Dilma Rousseff, a series of articles accompanying the #StopFavelaStigma campaign, Housing Policy Lessons from Rio’s Favelas, New Urban Agenda, Solidarity Economy, Virtuous Cycles of Development, Community Media Profiles, community-led Favela Tour Operators, as well as an ongoing series about Building the Favela and another on Brazilian Housing Law resulting from our partnership with the Cyrus R. Vance Center for International Justice. Reference Articles–In addition to these research series, a number of individual reference articles published in 2016 have become must-reads, used on college campuses and by organizers, planners and development professionals in Rio and around the world, including on The Importance and Challenges of Putting Favelas on the Map (republished in ArchDaily Brasil), The Favela as a Community Land Trust, The Deep Inequality of Brazil’s Tax Code, and those on Demystifying Brazil’s Web of Political Parties, the Olympic legacy and Mayoral elections. Our policy proposal around Community Land Trusts in favelas has sparked interest: we have been contacted by international organizations in both Argentina and Mongolia to advise them on the possibility. 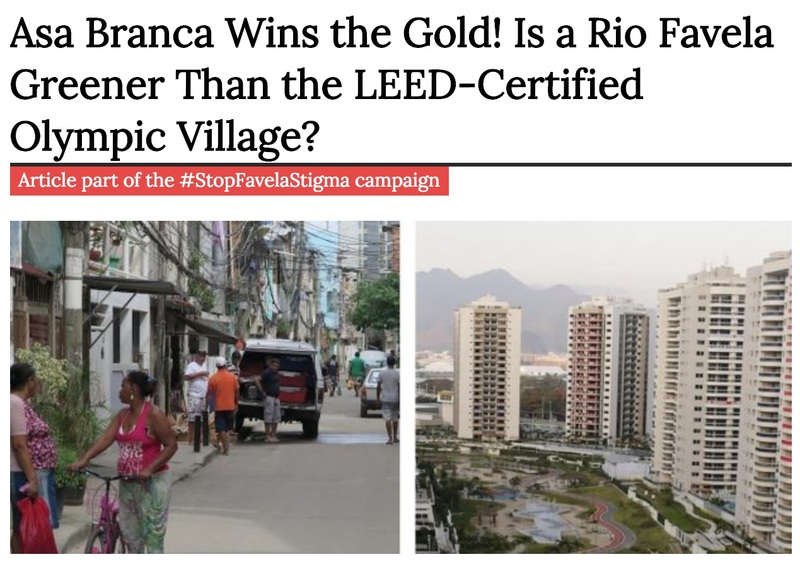 #StopFavelaStigma–As the Olympics were about to start, on August 3, 2016, Catalytic Communities ran an intensely planned one-day #StopFavelaStigma social media campaign to effectively denounce the unfounded stigma associated with Rio’s favelas. Using the hashtag #StopFavelaStigma, over the course of the day we published articles, destigmatizing messages, stories, photography and video, and shared posts by community organizers participating in the campaign, highlighting community voices to counter the damaging stereotypes that reinforce prejudice against residents of favelas. The hashtag gained significant traction on social media: a simple Facebook search revealed over 85,000 “People Talking About This”—a metric which includes likes, comments, shares, and tags on posts containing the hashtag. Beyond YouTube to Social Video–Beyond our RioOnWatchTV YouTube channel, this year we took advantage of the huge spotlight on Rio in the months leading up to, and during August’s Olympic Games, to produce our first social video segments carefully designed to inspire sharing on Facebook, which together were viewed by 45,600 people. 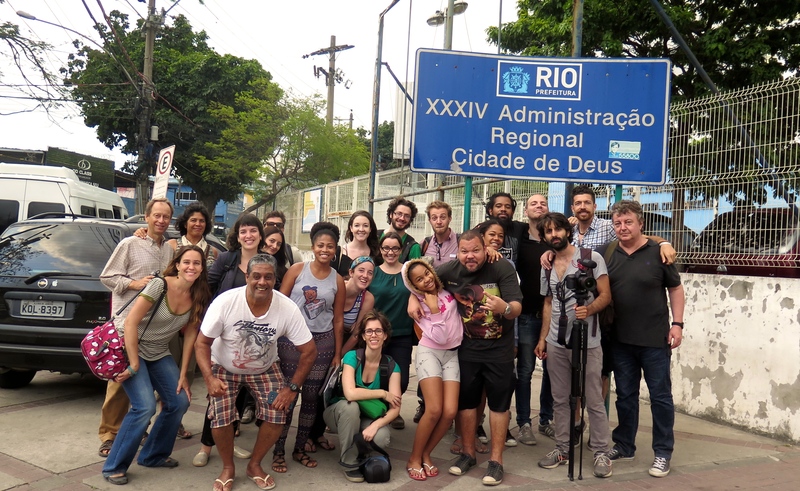 Thanks to talented interns Christina Thornell, Alejandra O’Connell, and Sophia Zaia, our social videos included, in chronological order: From Demolition to Recognition: Vila Autódromo’s Maria da Penha; Vila Autódromo Fights Displacement as Olympics Approach; Maré Residents Face Increase in Police Operations; Guanabara Bay Fishermen Struggle to Make a Living in Polluted Water; Protesters March Against Olympics in Rio de Janeiro; Sewage Problems Intensify in Rocinha; Passinho Dancer Goes to the Olympics; Favela Non-Profit Helps Boxers Reach the Olympics; Gold Medalist Rafaela Silva Welcomed Home in City of God; and Horto Residents Face Forced Evictions. 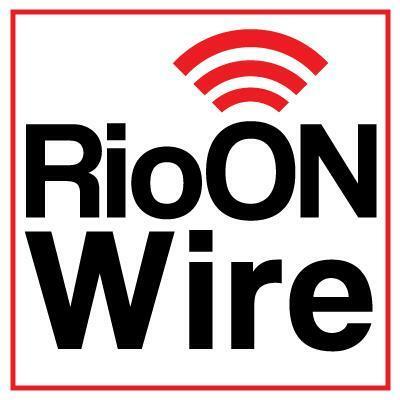 RioONWire, world’s first favela newswire, facilitated good journalism through the Olympics–RioOnWire wrapped up 17 months of 24×7 English-language coverage of favela news on August 31, after the Olympic Games. Different from our regular @RioOnWatch Twitter feed (for general news, in English and Portuguese, including retweets and conversations), our @RioONWire Twitter feed was launched on April 1, 2015, and served as a traditional Wire service focused on Rio’s favelas (think Bloomberg, Reuters or CNN scrolling updates along the bottom of your screen or in Times Square). In its 17 months of reporting, RioONWire unique-tweeted 14,400 times, averaging 28 tweets per day. The service never retweeted; rather we opted for issuing only easy-to-follow tweet-series. Carefully crafted tweet-series built on initial news or event announcements with further information that dissected stories and emphasized the complexity of media narratives on human rights violations, mega-events, and community organizing, featuring favela resident voices as often as possible. Through these additional contextual tweets, followers were offered nuanced perspectives on favelas that broke with the stigmatizing narratives that are perpetuated by some mainstream media. The service was widely used by international media professionals covering Rio in the lead-up to the Olympic Games. Read our summary of the program’s methodology and accomplishments, including user testimonials, here. Vila Autódromo’s Victory and @RioOnWatchLive–When possible CatComm staff, interns and collaborators use the @RioOnWatchLIVE feed to record real-time events as they unfold. In 2016 we were able to be particularly strategic in covering the critical weeks of Vila Autódromo’s struggle against Olympic evictions in late February and early March with the around-the-clock presence of an alternating crew of volunteers on the ground tweeting and recording video. This feed along with raw footage and context we provided to those who requested it, allowed international media outlets, from Australian Associated Press to The Guardian, to report on the community’s struggle in real-time, many not even present in Rio (and sourcing material directly from our sources). In 2016 our interns also put together a comprehensive timeline of Vila Autódromo’s story of resistance, used by journalists covering the community in 2016. More broadly and looking back, RioOnWatch provided ongoing documentation and visibility to Vila Autódromo’s struggle against unlawful evictions in name of the Olympic Games in 161 articles since 2010, connected the community to many of the journalists that ended up providing the critical coverage that led to the community’s relative victory, with twenty families ultimately remaining when the Games began. Social Media Growth–Across all of the above platforms, our social media reach averaged 216,356 per month in 2016 in comparison to 139,000 in 2015. Olympics Resources for Journalists–With 30,000 journalists coming to Rio to cover the Olympics, we produced a ‘packet’ of vital background information, context, and contact/story information from our broad community network for journalists arriving in Rio, learning from and dramatically expanding on what we did in 2014, alongside our @RioONWire service and general Journalist Support. 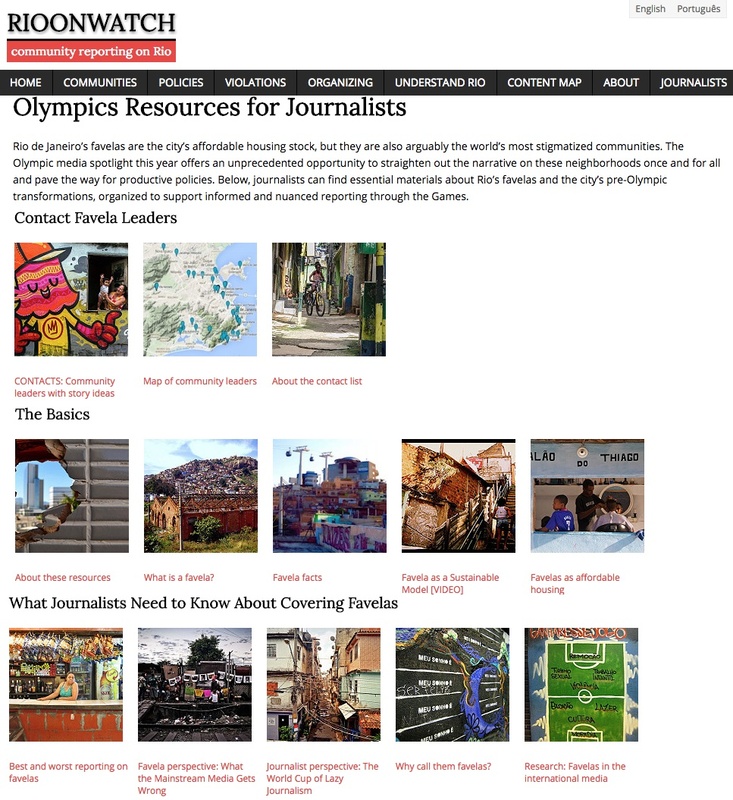 The final Olympics Resources for Journalists included community contact lists and maps, ‘What Journalists Need to know About Covering Favelas,’ policy reference pieces, must-reads, extensive background on Vila Autódromo, what’s great about Rio’s favelas, and community favela-tour recommendations. Recognized by the International Journalists’ Network several months before and then again just as the Games launched, we received innumerable reports of extensive use of these resources over those pre-Olympic months. ‘Reality Tours’ and Educational Community Visits–In August we led two Reality Tours of favelas affected by the Rio 2016 Olympic Games: the first to West Zone communities Vila Autódromo, Quilombo Camorim and City of God; the second to South Zone communities of Horto and Rocinha. These visits combined included some 30 journalists (from Australia, Canada, Brazil, USA, UK, Netherlands, Czech Republic, East Africa, Spain, Thailand, China, Belgium, Germany, Hong Kong and France), and represented media outlets and academic institutions such as the BBC, CBC Canada, The Guardian, The Washington Post, Czech Radio, EPA (European Pressphoto Agency), Thomson Reuters Foundation, Real Rio, Outside Magazine, Trouw, BNR, KRo-NCRV Radio, Université Paris Descartes, and The New School. These tours resulted in reports on CBC TV Canada, ESPN, Latin American Herald Tribune, Real Rio, Fox News Latino, among others, providing communities with coverage for strategic issues they were facing during the Games. In 2016 CatComm also provided our customary Educational Community Visits to university partners, this year for The American University, University of Delaware, University of North Carolina, and Lakeland College (Canada). What’s a Favela? Films Continue to Expand Favela vs. Slum Debate–Given the public’s curiosity about Rio and its favelas in the lead up to the Olympics, we took advantage of this spotlight to build awareness about what favelas actually are and where they come from. Working with a talented volunteer artist, Rodrigo Binarts, CatComm interns Sarah Garrahan, Julia Jones and Jay Owusu produced the “What’s a Favela” short animation. Our team also supported the production of the very effective “Inside Rio’s favelas, the city’s impoverished, neglected neighborhoods,” a Vox short documentary which, with excellent visuals, highlights similar themes and has reached over a million viewers. Articles and Opinion Pieces by the CatComm Team–In 2016 CatComm team members were invited to offer reflections on a number of issues given our strategic vantage point in the lead up to the Olympics. 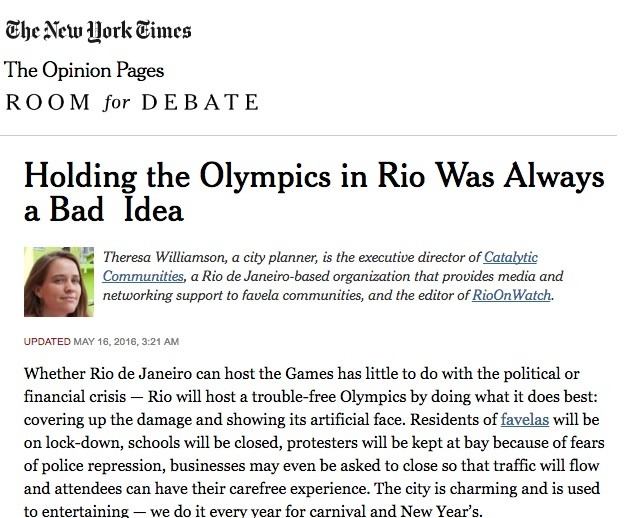 Executive Director Theresa Williamson was invited by The New York Times to comment on Rio’s Olympics-readiness in ‘Holding the Olympics in Rio Was Always a Bad Idea’, by Guernica to reflect on the value of informality and Rio’s favelas in ‘Opportunity for the Unknown’, by Metropolis to speak about the new urban paradigm the Olympics may set off in Rio, by openDemocracy to reflect on “Rio’s real vs. unmet Olympic Legacies,” and even virtually debated with Rio’s mayor head-on through a podcast with The Nation‘s Dave Zirin, among other TV, radio and print appearances. Communications Coordinator Cerianne Robertson offered her reflections on How Not to Write About Rio’s Favelas in POLITICO. CatComm Intern David Robertson even published his own list Busting 7 Myths About Rio’s Favelas in Buzzfeed. In all, CatComm was cited in 109 articles, TV and radio segments in 2016. Our Media Presence During the Games–During the Games, CatComm team members were interviewed by a number of high profile outlets, from NPR‘s On the Media to NBC‘s Today Show, HBO‘s Real Sports, the BBC, NBC News, Columbia Journalism Review, and beyond. 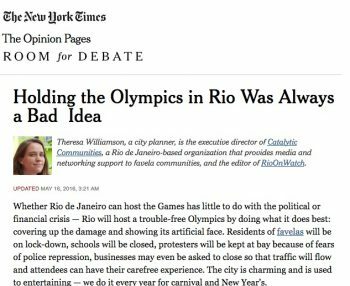 In all cases we used the Olympic spotlight to diffuse favela stigma and call necessary attention to inadequate infrastructure and broader demands in these communities. Specifically, the Today Show segment reached over 10 million people while HBO‘s reached over 4 million, Real Sports‘ greatest reach in the program’s 20 year history. Shaping the International Debate Through Media–In August, we supported dozens of media outlets reporting (see asterisks) on Rio’s favelas during the Games, dramatically influencing the narrative produced on these chronically misunderstood and under-recognized communities globally. In fact, of 250 articles we identified in the English-speaking media on favelas during the Games, we supported at least 56 of them. International journalists covering Rio de Janeiro and the favelas sought CatComm out throughout the year for information and support, and we strategically used these opportunities to educate them on favela communities’ efforts, the importance of participatory policies and community voices in coverage, encouraging journalists to be nuanced and accurate in their reporting. Final ‘Favelas in the Media’ Report Published and Victory for Community Voices–In December we released our report, “Favelas in the Media: How the Global Narrative on Favelas Changed During Rio’s Mega-Event Years, 2008-2016,” which studies how eight mainstream English-language news outlets reported on Rio’s favelas from October 2008—one year before the Olympics were awarded to Rio—through the Olympic month of August 2016. We analyzed all 1,094 articles that mentioned favelas during this period from The New York Times, The Wall Street Journal, USA Today, The Guardian, The Daily Mail, The Telegraph, Associated Press, and Al Jazeera. A preliminary version of this report was published in 2015. The final complete report was launched on Thursday, December 15, with a fantastic panel debating at Casa Pública, a widely respected hub for investigative journalism in Rio de Janeiro. Among the study results, we saw more favelas covered, more favela residents interviewed, and overall more space for different images of favelas as communities and hubs of culture and social change, rather than just sites of violence. Particularly notable, a subset of articles mostly from The Guardian‘s View from the Favelas series by favela-based journalists, covered more diverse topics than the average article in the overall dataset, did not portray residents as the solo perpetrators of violence, mentioned favelas by name rather than generalizations, preferred “community” and “neighborhood” to describe their homes, and most frequently portrayed favelas as “places with a sense of community.” The report has itself been the subject of reporting, in Vice Sports, Knight Center for Journalism in the Americas, and Rede TV. 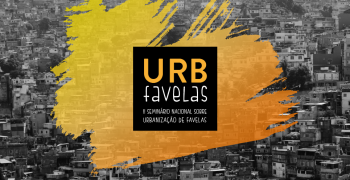 Favela Upgrading and Urban Planning Conferences–CatComm was involved with two important urbanism conferences that took place in Rio de Janeiro this year. During the World Planning Schools Congress on the first week of July, CatComm took part in the session “Participatory Sustainable Infrastructures: Case Studies in Community-Based Environmental Systems Planning and Implementation in Rio de Janeiro’s Favelas,” working with partners at Pratt Institute, the University of South Florida, Favela Verde NGO in Rio and Vale Encantado sustainable favela to draw out the potential of favela sustainability as a way to leapfrog sustainable development. 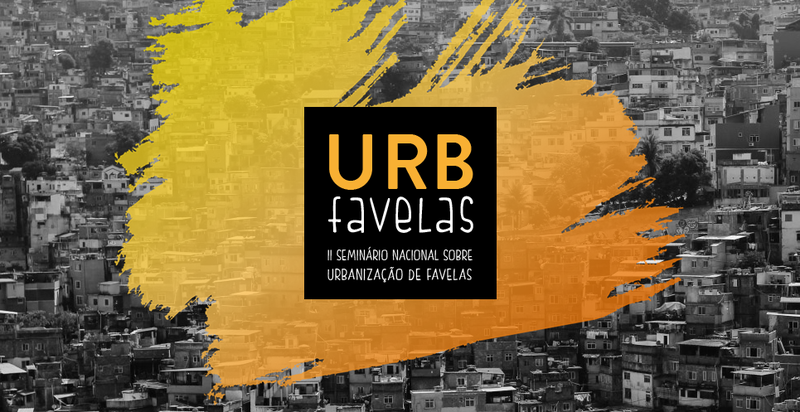 This was followed by our commitment of CatComm team members to the civil society organizing committee helping organize and host–as well as our engagement in two sessions at–the very successful National Favela Upgrading Conference (Urb Favelas) in late November. Favela as a Sustainable Model–Continuing with our long-term program to expand awareness about favela qualities as they relate to the potential favelas offer as models of sustainable and vibrant community development, in 2016 CatComm continued to expand our coverage of favela-based sustainability initiatives on RioOnWatch, continued to manage the Rede Favela Sustentável Facebook group, and experimented with applying the methodology of environmental certification (LEED ND) to a favela, only to find out it was more sustainable than the nearby certified Olympic Village. We were also co-organizers of The Global Summit gathering of communities and NGOs in Rio in late August, bringing favela-based organizations working for sustainable upgrading together with broader civil society movements focused on sustainable development that could support them. The prospects for favelas as sustainable communities will be the focus of our work starting in 2017 (read below for more). Book Projects and Support of Researchers–CatComm supported a number of research projects this year. 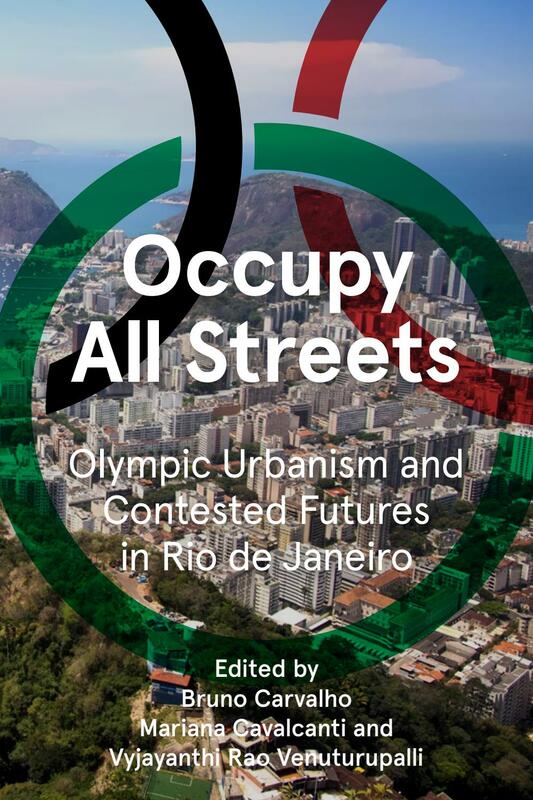 We provided support for Jules Boykoff’s Power Games, out in 2016, and offered full access to researcher Adam Talbot of the University of Brighton as he researched the chapter, “Transforming Policy Through Discourse Intervention: RioOnWatch, favelas, and the 2016 Olympic Games,” in a forthcoming book on the Rio Games. 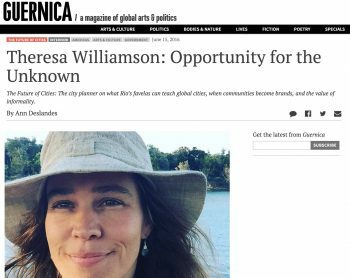 Theresa Williamson of CatComm was asked to contribute the chapter ‘Monopoly City vs. Singular City: Competing Urban Visions,’ to the now out Occupy All Streets: Olympic Urbanism and Contested Futures in Rio de Janeiro as well as chapters in two volumes due out in 2017, including the book Rio 2016: Olympic Myths, Hard Realities, edited by Andrew Zimbalist and to be published by Brookings. We have worked to support researchers, from undergraduates to PhDs, studying favelas and the impact of the Olympic Games, from McGill University, Radboud University, Utrecht University, University of Cambridge, University of Brighton, University of Nottingham, University of Wisconsin-Madison, Duke University, and Georgetown University. University Talks–In 2016 we conducted our annual University Tour speaking on campuses as well as a number of CIEE training programs for professors and students in Rio de Janeiro. 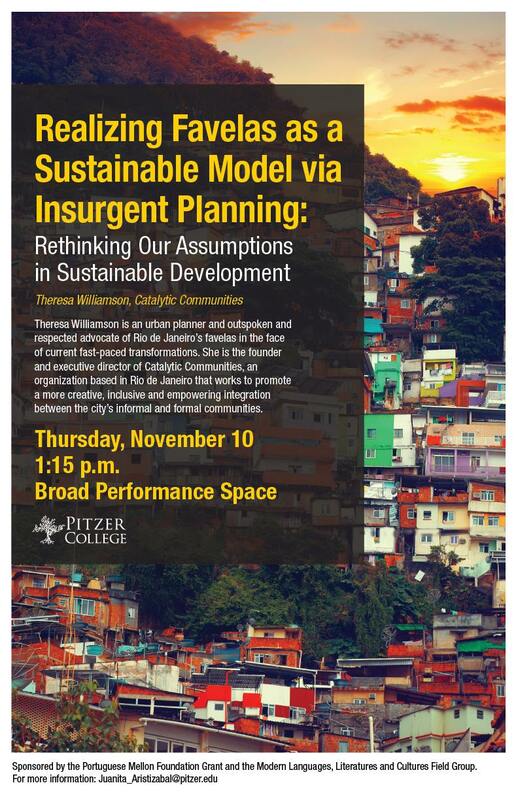 Due to the intense demands on the ground in Rio, Theresa Williamson traveled for only 10 days to the United States this year, and spoke at a smaller number of colleges than usual, these being: Rutgers University, California Polytechnic, Pitzer College, and the University of Wisconsin-Madison. Theresa will be available to speak on campuses in April and September 2017. 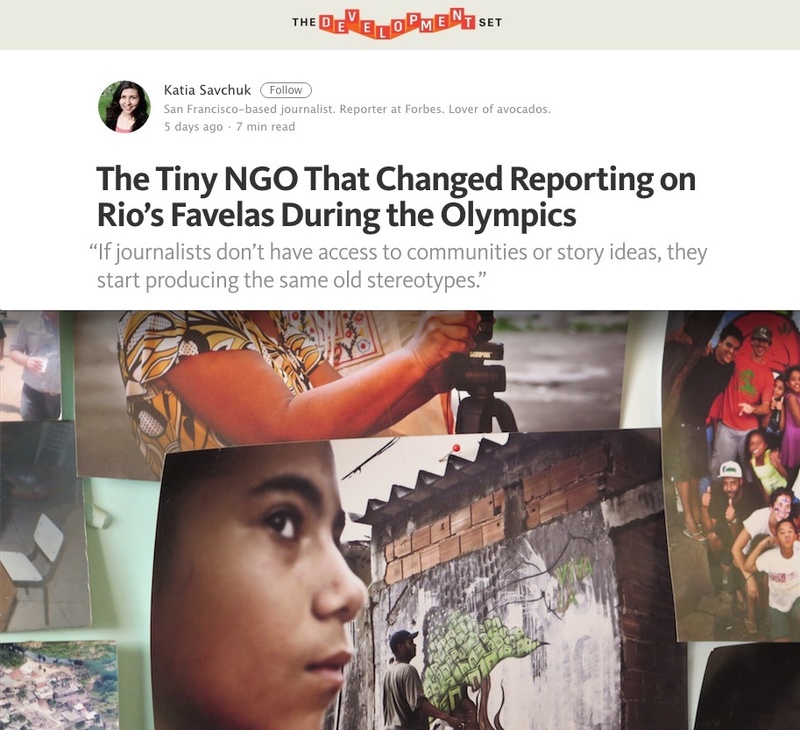 From 2010 through 2016, Catalytic Communities’ mandate was to harness the global Olympic media spotlight on Rio to build nuance and accuracy in reporting on favelas. We wanted to address the lazy, counterproductive and inaccurate narrative that dominated coverage and thus public perceptions of favelas in the past, and to replace it with a more subtle narrative that begins to engage in truthfully comprehending these complex communities. From our previous work we realized that the quantity and quality of policies aimed at favelas would suffer as long as they were seen as unworthy, precarious and temporary settlements. All of which couldn’t be further from the truth. The summary of 2016 above and our work in the previous years building up to it highlights our efforts and success in shifting this narrative. We are thrilled with all we’ve been able to do, thanks to so many supporters and collaborators around the world. We are now setting out to build on this momentum and all we’ve learned and accomplished, and are ready to dive into new projects and actions to meet prong three of the four-prong strategy of our organizational life cycle and strategic plan, started with our founding in 2000. Advocating on behalf of inclusive, integrative and participatory policies (and by doing so scaling these concepts beyond Rio). New ‘Green’ RioOnWatch–Starting in March/April, RioOnWatch will relaunch with a new editorial line focused on realizing the potential of favelas as sustainable communities, publishing community solutions and perspectives, opinions and organizing strategies that embolden and empower this vision. The site will deepen its role as a ‘popular urbanism’ resource, making urban planning concepts accessible to communities to engage in their own strategic development. In summary, the site will offer ideas on proactive green community urbanism rooted in Rio’s favelas. 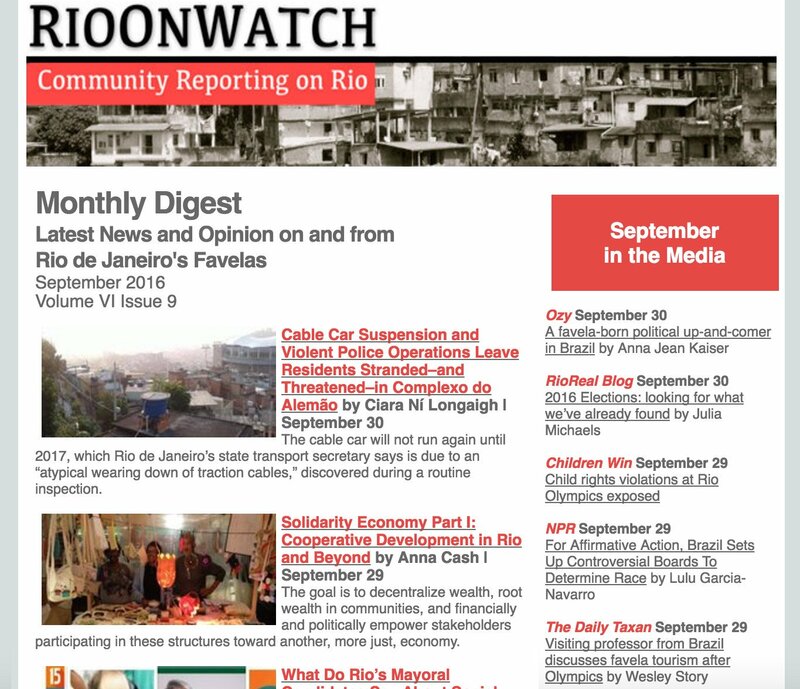 At the same time, RioOnWatch will maintain a connection to its roots and a responsibility to publish a subset of articles committed to ‘watchdog’ activities tracking policies directed towards favelas, the Olympic legacy and human rights. Sustainable Favelas Mapping, Exchange & Film Project–With support from the Heinrich Boll Foundation in Brazil, this project begins with a thorough mapping of all the environmental/sustainability/resilience initiatives we can identify from favelas all over Rio. We will then invite eight of these projects for a week-long exchange that will involve: a day of experience-sharing and solidarity-building; a day of brainstorming and problem-solving; four days where all eight projects will visit one another and see implementation, solutions and challenges on-the-ground; and a final day open to the public with presentations by participants and a ‘fair’ to share solutions from across the city. After the week-long exchange we’ll create a new version of the Favela as a Sustainable Model film focusing on these 8 projects and others from the mapping exercise. Mainstreaming Community Journalists–A major lesson from our Favelas in the Media report is the improvement in coverage quality and nuance when reporting is done by community journalists. Starting in 2017 we will have partnerships with community journalism outlets in Rio’s favelas, each one producing a unique monthly article for RioOnWatch discussing the city and community from their perspective that month. 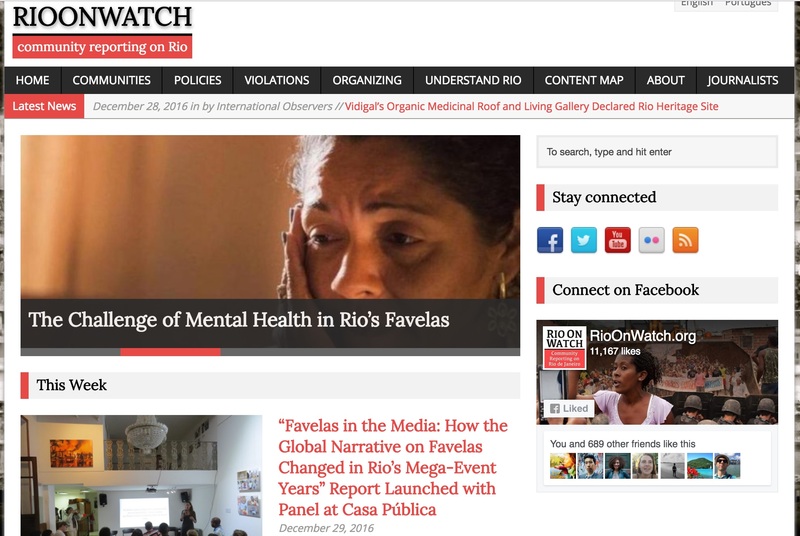 These articles will be featured on RioOnWatch not only to provide more visibility for community perspectives and news, but with the intent to demonstrate the qualities inherent in the production of news by favela news outlets and journalists. We will then co-organize a weeklong community journalism festival with Casa Pública in Rio, with nightly debates about favela media production, with speakers including community journalists, international correspondents, media researchers, and others; in the audience will be mainstream Brazilian media outlet representatives. The intention is to spark debate, inform the public, and to inspire these outlets to hire and strengthen community journalists within their ranks. RioOnWatch Replication Manual–What are the critical ingredients in the RioOnWatch model? From minute details of how we utilize social media, engage the press, and galvanize large numbers of contributors and translators, to broader philosophical questions of strategy and impact, we are now looking for resources to support the production of a multi-media toolkit that organizers around the world can use to create their own hyperlocal-to-global impact news site. Favela Perceptions Survey–Since 2010 CatComm has been undertaking annual research in large English-speaking cities worldwide regarding perceptions of Rio’s favelas. This research will be conducted one last time in 2017, followed by calculations and a report summarizing findings from 2010-2017. Nashwa Al-sharki, Laura Bachmann, Mariah Barber, Alex Besser, Louise Boesen, Anna Cash, Sarah Cronin, Nour El-Youssef, Laura Fairman, Luisa Fenizola, Lisa Godde, Daniel Gross, Raven Hayes, Meg Healy, Ava Hoffman, Lisa Hollenbach, Clare Huggins, Luke Kon, Christian Kuitert, Claire Lepercq, Ciara Long, Rhona Mackay, Nia McAllister, David Morsi, Mathilde Mouton, Eli Nemzer, Sabrina Norris, Alejandra O’Connell-Domenech, Gitanjali Patel, Christopher Peel, Natalie Southwick, Stephanie Reist, Mikayla Ribeiro, Juliana Ritter, David Robertson, Victoria Roehrich, Hammond Sale, Emilia Sens, Adam Talbot, Christina Thornell, Alix Vadot, Jody van Mastrigt, and Sophia Zaia.